It was a week of mixed emotions as the School recently farewelled its Graduating Class of 2018. There was joy, sadness, trepidation and excitement, mixed with a feeling of accomplishment. The School said goodbye to the departing Year 12’s with a series of events during Week 2 and I wish to thank and congratulate students for the mature and considered way in which they conducted their Valedictory celebrations. It was very pleasing to see parents attend the Valedictory Chapel Service on Wednesday 17th October, which took place after each Senior School House Group planted a tree on the School’s northern boundary. On the same afternoon the students attended an High Tea in the staff lounge where they received a letter they had written to themselves in Year 9 along with some ‘warm fuzzies’ from their peers. On Thursday morning the students arrived in their diverse and interesting costumes, claiming the teacher’s carpark as their own! The Senior School was then treated to the Year 12 Leavers’ Assembly, the highlight of which was certainly the ‘ABBBA-off’ battle between staff and students. Caylum Weeks also deserves a special mention for his efforts in hosting the event and his special storytelling talents! The students returned to the School on the Thursday evening for the formal Valedictory Assembly; a fitting celebration of the achievements and contributions of the graduating class to the School over many years. Good evening ladies and gentleman, staff and students. It is a great privilege and honour to recognise and thank the 2018 Graduating Class for their contribution to Peter Moyes Anglican Community School. All of these students have been at the School since Kindergarten and that deserves both a special welcome and a special round of applause! As a relatively new member of the Peter Moyes community, I have only just started to get to know the departing cohort. 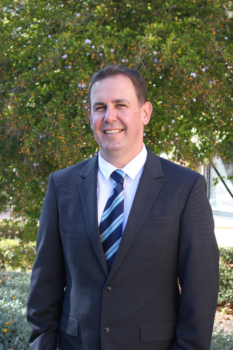 So in order to learn a little bit more about our Valedictorians, I spoke with the staff who best know the Year 12’s, our dedicated and hardworking Heads of House. What follows is a summation of their reflections. Year 12’s, the Heads of House are very proud of your achievements over the years, your various successes in a wide range of pursuits from great scholarly achievements, to the cultural pursuits of performance and music through to sport. They have seen you willingly and enthusiastically grasp the many leadership opportunities, both formal and informal to positively influence the student body as a whole. They have appreciated your willingness to give back to the community and your generosity of spirit that have resulted in significant contributions to assorted charities. The Heads of House will also miss your ability to commit fully and wholeheartedly to events such as your Year 10 social and School Ball where all students were fully involved, and you even managed to get all of your teachers up and dancing! The Heads of House have been most impressed by your ability to come together as a powerful force; one of which the School can be extraordinarily proud. You support each other and have demonstrated on numerous occasions that you can work together to achieve your goals. That is not to say that there are no individuals, indeed I am told there are many characters in Year 12 who have created extra work for staff at times, but have also provided many laughs and kept all teachers on their toes! The graduating class of 2018 have been led this year by a cohesive and enthusiastic student leadership group. Their organisation and engagement with the teaching staff have been like no other Year 12 cohort before them. They have worked collectively to support each other through the challenges of Year 12 leaving a lasting legacy for future students to follow. I must say that I wholeheartedly concur with the summation of the Heads of House; in my short time at this school I have been very impressed and proud of the way the Year 12’s have conducted themselves as they have prepared to leave Peter Moyes Anglican Community School. They will leave this evening able to hold their heads high. As our Year 12 students prepare to graduate, it is especially important that we recognise the support and efforts of those who have worked so hard to assist our students in reaching this important stage of their lives. To the parents of our Year 12 students I thank you for all that you have done to support your children. You deserve our congratulations for guiding your child to this point, supporting them through all the homework, exams, uniform replacements, social activities and sporting and co-curricular events, not to mention the trials and tribulations of social media and simply being a teenager! We thank you for choosing to send your child to Peter Moyes Anglican Community School. Choosing a school is a big decision for parents. We understand the sacrifices families make to send their children to our school and we remain ever grateful that you chose to do so. The other significant group of people to be thanked and recognised this evening are the School’s staff. Led by Mrs. Natalie Shaw, Senior School teachers have worked tirelessly to assist our Year 12 students, just as their Primary and Middle School colleagues have done in the years beforehand. During the course of their schooling, the majority of students here tonight have established significant and lasting relationships with our staff based on trust and mutual respect. On behalf of all our students, but particularly our departing Year 12 cohort, I thank all of the staff at this school for their patience, kindness, passion, energy and dedication. Finally, to the graduating class of 2018 assembled here for the very last time, please accept our collective thanks for the contributions that you have made to the life and development of Peter Moyes Anglican Community School. No matter how long you have been part of this community, whether it has been 14 years or 14 months, you have embraced it and in turn have been embraced by it. You are and always will be a part of the PMACS Community. Teachers take great pride in hearing about the success of past students, so please come back and let us know when you graduate from university, land a dream job, get married, have a baby or win lotto! Equally, we are and always will be here to support you, even if we lose sight of you. Rest assured that if you ever find yourself in trouble, we will do what we can to help you. You will always be part of this school community. In concluding, I congratulate all Year 12’s on making it this far! I am sure your parents will attest that it has been a long, but worthwhile journey, even if some here tonight thought this day might never come! Year 12’s I hope you realise that the School community will miss you and know that we are sad to see you go. But as one chapter concludes, so the next exciting chapter begins. We send you off with every confidence that you will make the most of life’s opportunities. Go with our best wishes and stay true to our motto, to Act Justly and honour God, wherever the road may take you! Last Thursday and Friday the Primary School’s Athletics Team claimed victory in the Northern Inter-School Primary Sports Association Athletics Competition. The Carnival ran over two days and the School’s team showed excellent perseverance, tenacity, skill and talent to secure the win! Many congratulations to Mr. Senior and his dedicated team of coaches and staff! The School was very proud to host the annual SYNOD of the Diocese of Perth during the October School holidays. Over 400 delegates attended SYNOD, with many commenting on the quality of the School’s facilities and the outstanding catering prepared by Sheena Richardson and her team. SYNOD provided another opportunity for many visitors to come to the School for the first time and explore our wonderful campus and environment. The next iteration of SYNOD has already been locked in at PMACS for 2019. In concluding, I would like to wish all of our Year 12 students the very best for their upcoming exams; I have every confidence that you will do yourselves and the School proud.